It's been awhile since I've talked anime. So here we go with another witty and thrilling journey into my domain of nerdom. Yu Yu Hakusho is a popular show. I describe it as being the perfect show to kill a Dragonball Z hangover. 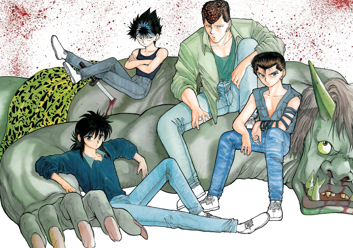 If you are looking for a show in the same vein then Yu Yu Hakusho is a great place to start. We also have a lot of the same voice talent and Funimation is behind the English editions of both shows. So there is a familiarity. But it's also different enough to stand on its own. Comprising of 112 episodes split into four sagas (and four seasons in America), Yu Yu Hakusho is a longish show but not long enough to where you wonder if the thing will ever end. I mean, I love some long shows, but sometimes things go on for freaking ever and you forget what the hell happened in the first saga by the time you get to the ninth saga. As with Dragonball Z, we get characters coming back to life and more or less ruining a lot of the time and effort put into killing them off in the first place. We get the endless horde of villains who become more evil and stronger the further into the series you go. And of course we have the necessary happy ending because the show is really about fighting and fun and ending the show on a down note wouldn't have been true to style. That's not to say the show isn't good, though. If you're not expecting Cowboy Bebop type of greatness and drama. The show starts out with our main character Yusuke Urameshi (just reverse the order of the first and last names if you want to be a real anime nerd) giving his life to protect a child. Well, Yusuke was a real prick in life and the folks in the spirit realm are pretty surprised that Yusuke would do such a thing. So surprised in fact that there is actually no spot reserved for Yusuke in the spirit realm just yet. Thus our fourteen year old dead hero is given a second chance at life, but there's a catch. Of course there is. Yusuke must become spirit detective if or once he regains his life. All of this stuff is pretty much resolved in the Spirit Detective Saga. So this is nothing too spoilery. And this show is twenty years old and has been available in English for ten years. If you're still missing this show then it's time you unfuck that. The second saga is the Dark Tournament Saga and it takes us from episode 26 to 66 and it is by far my favorite part of the show. The younger Toguro brother is my favorite villain in this show and it doesn't hurt that he's voiced by Dameon Clark, either. While I like the show as a whole and the final two sagas are good... there's just no topping this part of the show. The third saga is the Chapter Black saga and it is sort of a place filler. I mean, it's good and it is far from pointless and Sensui is a cool villain, but he isn't Toguro and that epic feel from the previous saga just isn't there. Again, it's not bad and there are some great parts, but is it better than the Dark Tournament? Not quite. The fourth saga is the Three Kings saga and I'm not quite sure what the hell happened here. Our main character is now sort of demonic and demon world has now become a place of democracy where contestants fight in order to claim the throne. It is basically a fusion of the last two sagas. But the resolution is worth it. I just couldn't help feeling that maybe the Dark Tournament Saga cast too much of a large shadow over the rest of the show.